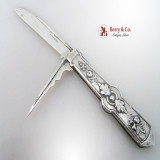 American sterling silver (all Silver) folding fruit knife with embossed fruit decorations on the handle, c.1870s. This beautiful knife is 5 5/8" unfolded, 3 1/8" folded and weighs 38 grams or 1.22 ozs Troy. The soft, warm, original finish is present, with no buffing or machine polishing. The excellent original condition and clear, crisp detail, with no monograms, removals, repairs or alterations, make this an especially attractive offering. American sterling silver folding two blade fruit knife by Gorham Silversmiths, pattern number 851, c.1880. This fabulous knife has a honeycomb peened finish on one side and a scene of three wolves chasing a horse drawn sleigh in full flight through the woods in the snow, replete with a bell decorated harness and a driver frantically whipping the horse for more speed. The sleigh is carrying a cask of Brandy. The wolves must know just how good the Brandy is! Weighing 37 grams or 1.2 ozs. Troy, this special knife has a case 3 1/8" long and is 5 1/2" long when opened. With the pick blade opened, the knife is 5+" long. The top edge of the knife has hatch work and Zig Zag decorations. The spring actions of both blades are excellent. The soft, warm, original finish is present, with no buffing or machine polishing. The excellent original condition and clear, crisp detail, with no monograms, removals, repairs or alterations, make this an especially attractive offering. American sterling silver and rosewood cigarette or cigar box, Reed and Barton, c.1940s. 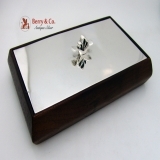 This elegant box is 7 1/2" long, 4 1/2" wide, 1 1/2" deep, silver weight is 163 grams or 5.25 ozs Troy. The soft, warm, original finish is present, with no buffing or machine polishing. The excellent original condition and clear, crisp detail, with no monograms, removals, repairs or alterations, make this an especially attractive offering. American sterling silver macaroni server in the Oriental pattern by Polhemus- Shiebler, 1855, retailed by Wm Carrington & Co, San Francisco. 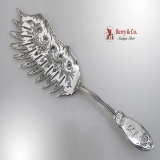 This magnificent server is 11 1/8" long and weighs 133 grams or 4.3 ozs Troy. The excellent original condition and clear, crisp detail, monogrammed GEP in an ornate period script, no removals, repairs or alterations, make this an especially attractive offering. The soft, warm, original finish is present, with no buffing or machine polishing. 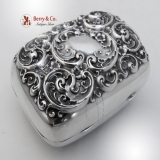 American sterling silver floral and scroll repousse soap box by Whiting, c.1890s. This beautiful box is 3 1/8" long, 2 3/8" wide and weighs 72 grams or 2.3 ozs Troy. The soft, warm, original finish is present, with no buffing or machine polishing. The excellent original condition and clear detail, with no monograms or removals, repairs or alterations, make this an especially attractive offering. 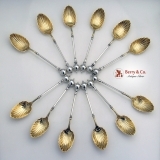 American coin silver set of 12 dessert spoons with ball finials, George Sharp, retailed by Baily & Co, 1868. These beautiful spoons are 5 5/8" long and weigh a total of 220 grams or 7.1 ozs Troy. The soft, warm, original finish is present, with no buffing or machine polishing. The excellent original condition and clear, crisp detail, with no monograms, removals, repairs or alterations, make this an especially attractive offering. English sterling silver George III meat skewer by George Smith and William Fearn having a full set of London Hallmarks for 1790. 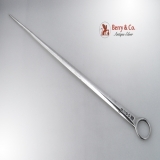 This attractive and useful skewer is 12 1/4" long and weighs 76 grams or 2.4 ozs. Troy. Slightly wavy at the end, otherwise, the soft, warm, original finish is present, with no buffing or machine polishing. The excellent original condition and clear, crisp detail, with no monograms, removals, repairs or alterations, make this an especially attractive offering. Scottish George IV stuffing spoon by Alexander Cameron of Dundee, having a full set of Edinburgh Hallmarks for 1826. 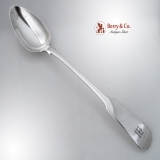 This scarce and useful Scottish Provincial stuffing spoon has an ornate, slightly later script monogram: M and is 12 3/8" long, weighing 116 grams or 3.7 ozs. Troy. Monogrammed as described above, the soft, warm, original finish is present, with no buffing or machine polishing. The excellent original condition and clear detail, with no removals, repairs or alterations, make this an especially attractive offering. Scottish 18th Century stuffing spoon in a Shell pattern by William and Patrick Cunningham, having a full set of Edinburgh Hallmarks for 1786 - 1788. The front of the handle has an ornate, period script monogram: JK. 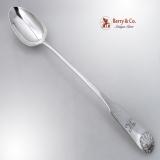 This elegant and useful Georgian stuffing spoon is 12 1/2" long and it weighs 96 grams or 3.1 ozs. Troy. Monogrammed as described above, the soft, warm, original finish is present, with no buffing or machine polishing. The excellent original condition and clear detail, with no removals, repairs or alterations, make this an especially attractive offering. English sterling silver George II meat skewer by Ebenezer Coker having a full set of London Hallmarks for 1757. 1757 was the last year that Coker used the old fashioned script EC mark. This handsome and still very useful skewer has a spread winged eagle holding a snake in its beak, likely the from crest of the Childs family. Weighing 84 grams or 2.7 ozs. Troy, this desirable skewer is 12 1/4" long. Crested as described above, the soft, warm, original finish is present, with no buffing or machine polishing. The excellent original condition and clear detail, with no removals, repairs or alterations, make this an especially attractive offering. American sterling silver double walled napkin ring by Somon Brothers, c.1890. This beautiful napkin ring is 1 3/4" in diameter, 1 1/2" tall and weighs 38 grams or 1.22 ozs Troy. The excellent original condition save for a couple minor dents, clear detail, monogrammed B, no removals, repairs or alterations, make this an especially attractive offering. American Arts & Crafts sterling silver, hand made, hand hammered napkin ring by The Randahl Shops, c. 1930. 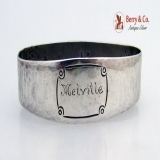 This handsome napkin ring is inscribed Melville and measures 2 3/4" X 7/8", 7/8" tall and weighs 23 grams. The excellent original condition and clear, crisp detail, with no removals, repairs or alterations, make this an especially attractive offering. 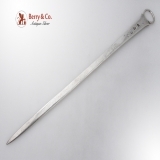 Inscribed as described above, the soft, warm, original antique finish is present, with no buffing or machine polishing. 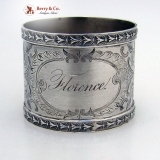 American coin silver Aesthetic style napkin ring, c.1875, inscribed: Florence. This elegant napkin ring has nicely detailed floral and foliate bright cut decorations surrounding a large shell bordered cartouche containing the inscription: Florence. The applied, belleflower borders add to the appeal of this special napkin ring. 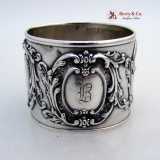 Weighing 21 grams, this attractive and ornate napkin ring is 1 3/4" in diameter and 1 7/16" tall. Inscribed as described above, the soft, warm, original finish is present, with no buffing or machine polishing. The excellent original condition and clear detail, with no removals, repairs or alterations, make this an especially attractive offering. American coin silver engine turned napkin ring, c.1860. 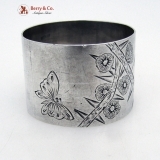 This beautiful napkin ring is 1 5/8" in diameter, 1 1/4" tall and weighs 18 grams. The excellent original condition and clear detail, inscribed Lottie, no removals, repairs or alterations, make this an especially attractive offering. American sterling silver napkin ring in the Old Master pattern by Towle Silversmiths, c.1942. This elegant, ornate napkin ring is 1 3/4" in diameter, 1" tall and weighs 21 grams. The soft, warm, original finish is present, with no buffing or machine polishing. The excellent original condition and clear, crisp detail, with no monograms, removals, repairs or alterations, make this an especially attractive offering. We have two of these napkin rings available. The price is for one. 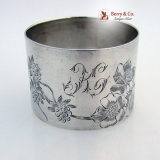 French sterling silver napkin ring with beautiful bfloral engraved decorations, c.1890. 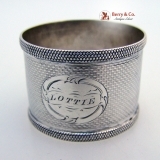 This beautiful napkin ring is 2" in diameter, 1 3/8" tall and weighs 42 grams or 1.4 ozs Troy. The excellent original condition and clear detail, monogrammed K in an ornate period script, no removals, repairs or alterations, make this an especially attractive offering. American sterling silver pair of napkin rings in the Repousse pattern number 28 by S. Kirk and Son Silversmiths, c.1940. 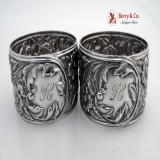 Each of these ornate napkin rings is 2" in diameter, 1 1/4" tall, weighing 48 grams or 1.5 ozs. Troy. The soft, warm, original finish is present, with no buffing or machine polishing. The excellent original condition and clear, crisp detail, monogrammed H, no removals, repairs or alterations, make this an especially attractive offering. American sterling silver Aesthetic style napkin ring, c.1880 with nicely detailed and unusual engravings of roses, thorns and a butterfly by A. Stowell and Co., c.1880. This unusual napkin ring is 1 3/4" in diameter, 1 1/4" tall and weighs 31 grams or 1 oz. Troy. The soft, warm, original finish is present, with no buffing or machine polishing. The excellent original condition and clear, crisp detail, with no monograms, removals, repairs or alterations, make this an especially attractive offering. American sterling silver napkin ring, c.1890 by Frank M. Whiting Silversmiths. 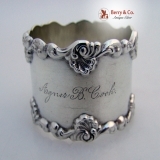 This handsome napkin ring has an engraved laurel wreath and ribbon cartouche containing the inscription: Harry. Weighing 25 grams, it is 1 3/4" in diameter and 1" tall. Inscribed as described above, the soft, warm, original finish is present, with no buffing or machine polishing. The excellent original condition and clear detail, with no removals, repairs or alterations, make this an especially attractive offering. American sterling silver Arts and Crafts hand hammered, acid etched round napkin ring in the Colonial pattern by Marshal Fields of Chicago Illinois, c. 1915. 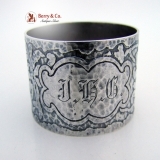 This very unusual Arts and Crafts hand made napkin ring has an ornate, period Gothic script monogram: JHG and is 1 3/4" in diameter, 1 1/4" tall and weighs 41 grams or 1.3 ozs. Troy. We have never seen an acid etched, hammered napkin ring, nor have we seen a round napkin ring by Marshall Fields in the Colonial pattern. Monogrammed as described above, the soft, warm, original finish is present, with no buffing or machine polishing. The excellent original condition and clear detail, with no removals, repairs or alterations, make this an especially attractive offering. Chinese export sterling silver napkin ring depictiong a procession of scholars, c.1880. 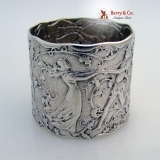 This beautiful napkin ring is 2" in diameter, 1 3/8" tall and weighs 37 grams or 1.2 ozs Troy. Inscribed Millard. The excellent original condition and clear detail, with no removals, repairs or alterations, make this an especially attractive offering. American sterling silver napkin ring in the Fontainebleau pattern by Gorham, c.1885. This beautiful napkin ring is 1 7/8" in diameter, 1 5/8" tall and weighs 58 grams or 1.9 ozs Troy. The excellent original condition and clear detail, monogrammed B, no repairs or alterations, make this an especially attractive offering. 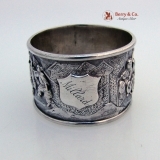 American sterling silver napkin ring in a Baroque pattern by Towle, c.1890. This beautiful napkin ring is 1 7/8" in diameter, 1 1/2" tall and weighs 38 grams or 1.22 ozs Troy. The excellent original condition and clear detail, inscribed Agnes B Cook, no removals, repairs or alterations, make this an especially attractive offering. American sterling silver napkin ring with applied pong lily borders, Unger Brothers, c.1890. This beautiful napkin ring is 1 7/8" in diameter, 1 7/8" tall and weighs 46 grams or 1.5 ozs Troy. The excellent original condition and clear detail, inscribed Elmer Meier, no removals, repairs or alterations, make this an especially attractive offering. 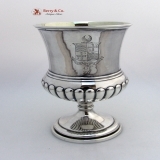 Scottish sterling silver large goblet, bearing a full set of hallmarks for Edinburgh 1837, James McKay. This handsome antique goblet is 6 1/4" tall, 4 1/8" in diameter and weighs 298 grams or 9.6 ozs Troy. The soft, warm, original finish is present, with no buffing or machine polishing. This goblet has a crest and a motto: Honor et Virtus. The excellent original condition and clear, crisp detail, no removals, repairs or alterations, make this an especially attractive offering. 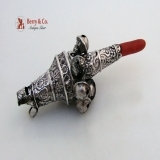 Fancy sterling silver baby rattle and whistle with 8 bells, floral repousse decorations and coral handle, c.1880. This unusual rattle is 4 5/8" long and weighs 48 grams or 1.5 ozs Troy. The soft, warm, original finish is present, with no buffing or machine polishing. The excellent original condition save for some minor wear consistent with age, no monograms, removals, repairs or alterations, make this an especially attractive offering. 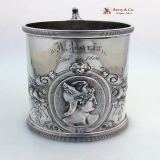 American coin silver large Medallion Baby Cup by Wood & Hughes, c.1860. This magnificent baby cup is 3 3/4" tall, 4 3/4" across the handle, 3" in diameter and weighs 193 grams or 6.2 ozs Troy. Inscribed J. Paris Feb. 17th 1809. The soft, warm, original finish is present, with no buffing or machine polishing. The excellent original condition and clear, crisp detail, no removals, repairs or alterations, make this an especially attractive offering. English sterling silver pap boat having an applied spear and dart rim with a full set of clear London Hallmarks for 1820. This large and attractive feeding bowl is 5 1/2" long, 3 1/4" wide, 1" deep and weighs 73 grams or 2.3 ozs. Troy. The soft, warm, original finish is present, with no buffing or machine polishing. The excellent original condition and clear, crisp detail, with no monograms, removals, repairs or alterations, make this an especially attractive offering. 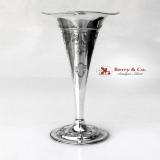 American sterling silver trumpet vase with hand chased Belleflower decorations on the body and base, having a fluted flared rim and a stepped, pedestal base by the Whiting Division of Gorham Silversmiths, date marked for 1923. This elegant vase has a closed bottom but is not filled or re-enforced, being all sterling silver. The center of the body has an ornate, period monogram: C. Weighing 447 grams or 14.4 ozs. Troy, this special vase is 14" tall, 5 1/4" in diameter at the rim and 4 1/2" in diameter at the base. Monogrammed as described above, the soft, warm, original finish is present, with no buffing or machine polishing. The excellent original condition and clear detail, with no removals, repairs or alterations, make this an especially attractive offering.